Another short post this week. I guess the blog hasn’t been high on my list of priorities lately. I had someone ask me the other day why we don’t post videos or stick to a regular blogging schedule. My immediate response, when asked about videos, is always to shudder and say “you don’t want to see us on video.” But there’s more to it than that. This blog has never been about gaining as many followers as possible, becoming YouTube stars (please no) or even making this a formal space where we post on the same day every week. I write and post photos mainly as a way for us to keep a log of our travels, and all you wonderful people who follow along and send us emails or write comments are the bonus! So while I will always update this space in some sort of fashion, don’t expect us to jump on the video bandwagon anytime soon. Going back in time a few weeks, we left our lovely spot at Lee’s Ferry Campground on Friday afternoon and made the short drive to the North Rim of the Grand Canyon. Since our route back to Utah went right past the entrance road, it only made sense to stop for a night or two. We wanted to stay at the campground inside the park, but it closed at the end of October. Fortunately, there are a number of boondocking options not far from the park entrance. It was late in the day and about to get dark so we chose an easy spot near Jacob’s Lake right before the turn to the park entrance road. I didn’t take any photos of our spot, but I did get one of this crazy looking squirrel with a bright white tail. Tim said it was an Abert’s squirrel but I didn’t remember them having white tails. I later looked it up and it’s actually a Kaibab Squirrel. After a cold night in the forest (the North Rim is up at 8,000 ft.) we headed down the park road for some hiking. Since we didn’t yet know where we would spend the night we brought the Airstream along. 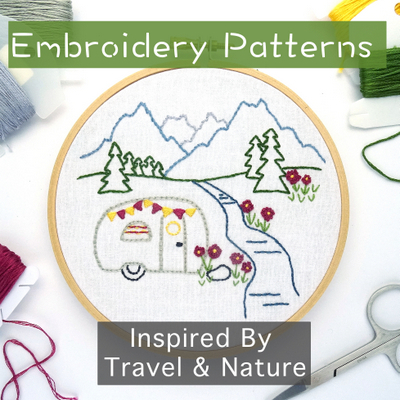 I know a lot of RVers prefer to leave their rolling homes behind when exploring, but we rather enjoy the convenience and novelty of having our kitchen, bathroom, and full wardrobe with us. Also, this late in the year with both the campground and visitor center closed we didn’t expect to have any issues finding parking. 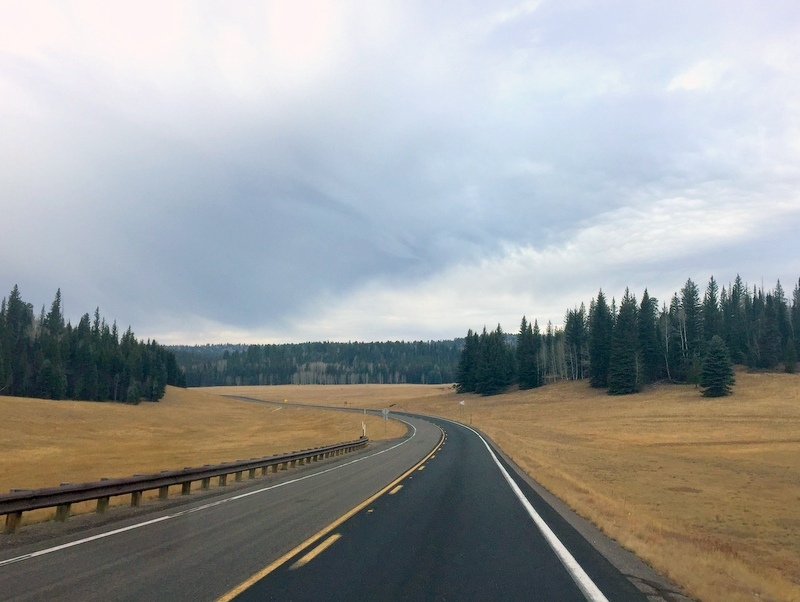 The drive from Jacob’s Lake to the rim is about 50 miles. We only saw one or two other cars the whole way. 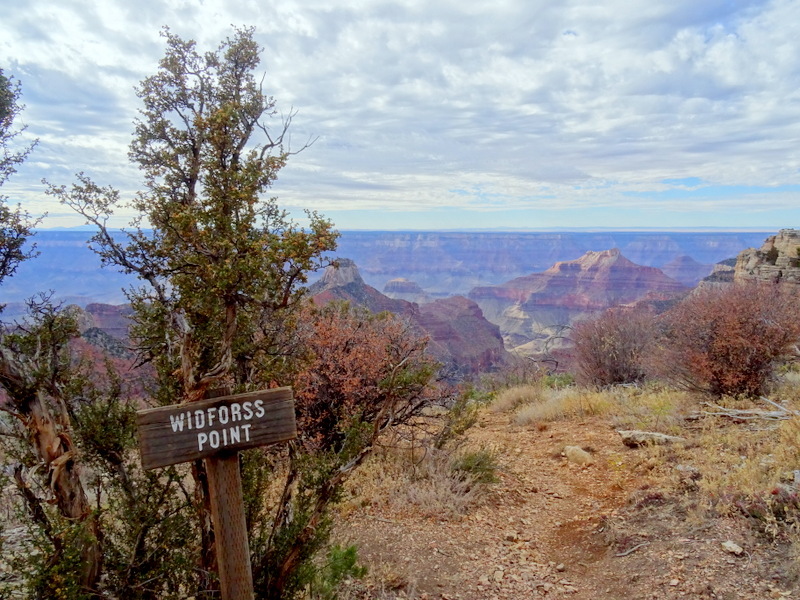 Our destination was the Widforss Trailhead. After blowing past the sign that said: “no trailers or buses” (shhh…don’t tell) we found the small parking lot, bundled up and set off to hike along the rim. I’m not sure of the actual temperature, but I hiked the entire trail wearing a down jacket which tells me it probably never got out of the 40s. 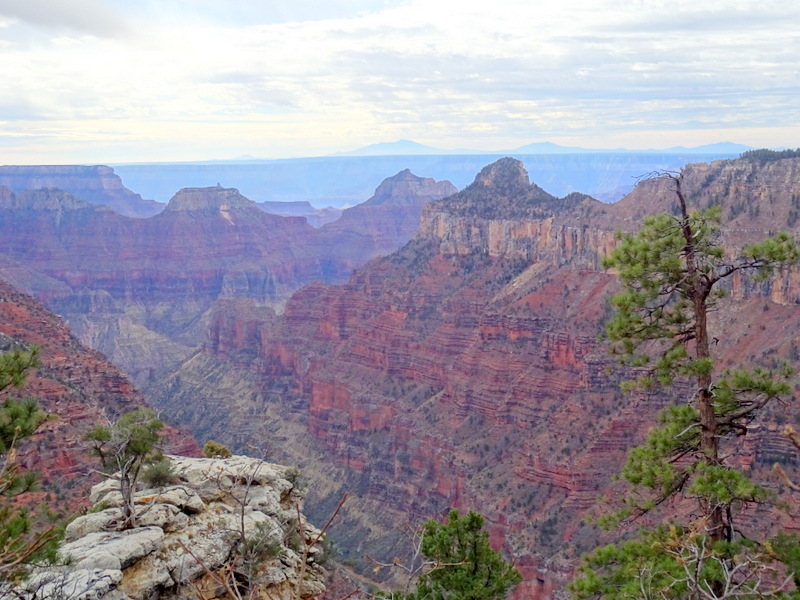 Despite the persistent clouds, we enjoyed the occasional glimpses into the canyon. The first overlook did not disappoint! The Widforss Trail is a 10-mile trek through an evergreen forest with lots of rolling up and down terrain. 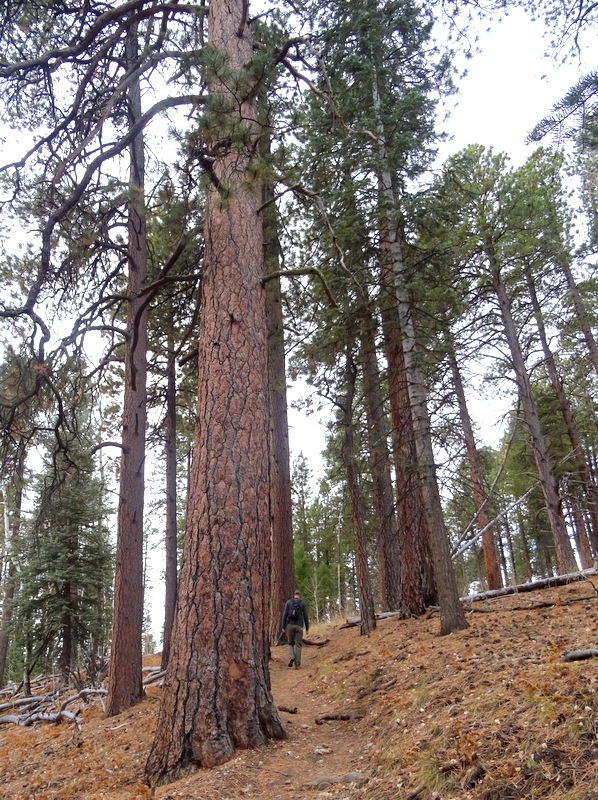 After several months of hiking almost exclusively in the open desert, it was kind of a novelty to be surrounded by big trees. Windblown and cold, but look… that’s the Grand Canyon behind us! After a quick snack, we headed back down the trail to the parking area. On the way back we passed a pair of hikers, bringing the total of people we saw on this trail to two and officially making this the least crowded national park visit ever. 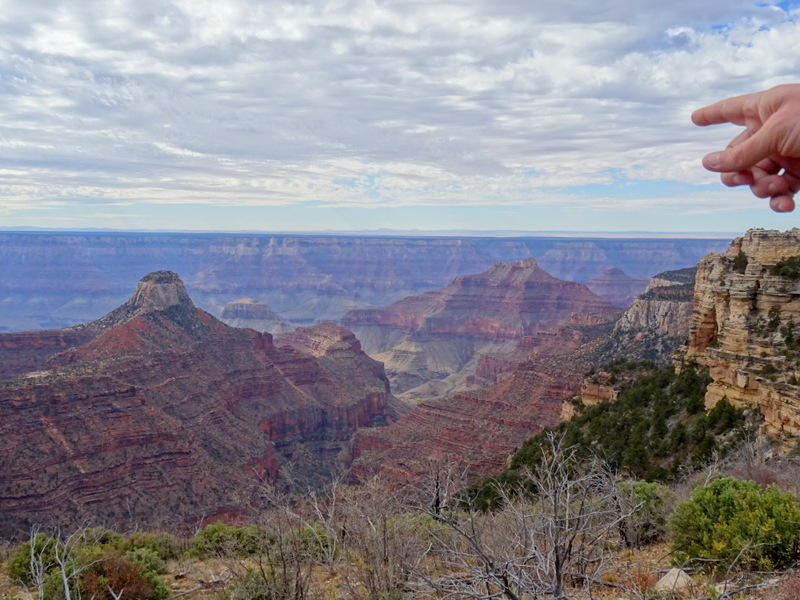 It was still early in the day and the clouds were clearing out so we drove down to the Visitor Center to see the canyon from there. After getting our fill of the canyon view we hoped back in the truck for a short drive to our next destination. 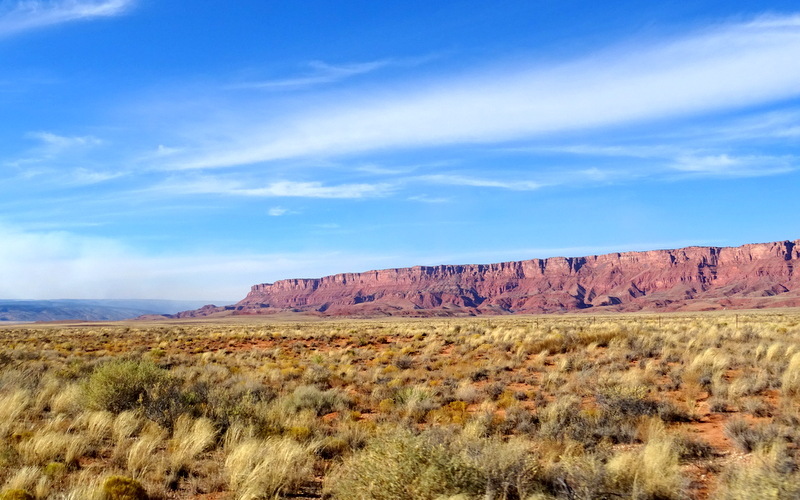 Originally, we thought we might spend another night in the area but ultimately decided to leave the cold behind and instead make the short drive to Hurricane, Utah where we would be for the next month. 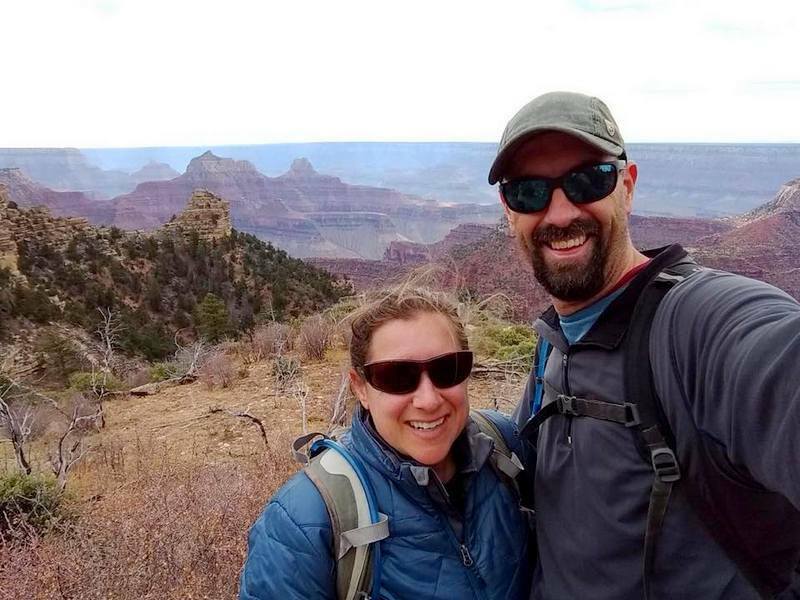 It might have only been a short visit, but we’re very glad that we made the time to stop and explore the North Rim! I’m with you…I will never be a video person, don’t hardly even watch them, I’d rather read something than watch it. It’s weird to me that someone would question your modus operandi! What a terrific animal sighting! Totally looks like an Aberts except for that cool tail! Yup, I don’t think I’ve watched more than one or two RVing videos – not my thing. I didn’t take this person’s question as a criticism. It was more of a question about why we wouldn’t want to give the blog a wider appeal. Another reason why we keep it personal and choose not to monetize. Beautiful photos! It’s been a few years since we’ve been to the North Rim, but we loved it. Time for a revisit. 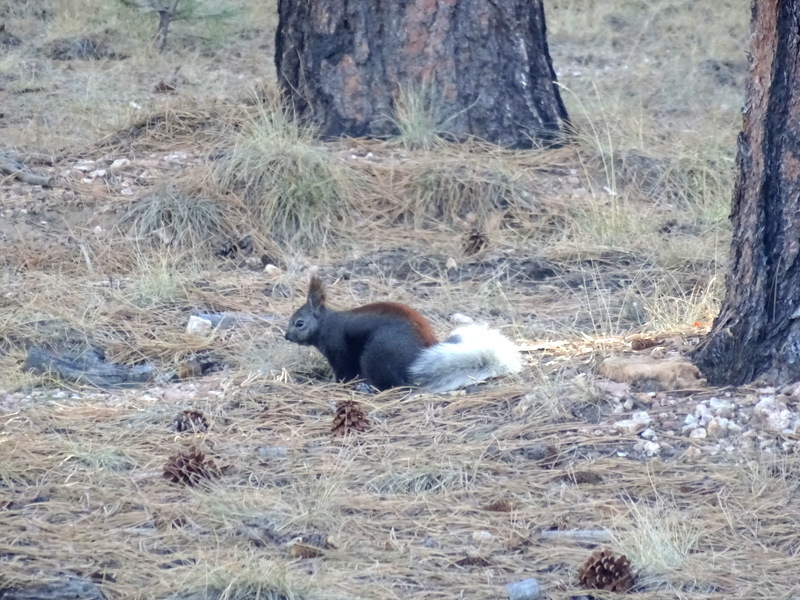 And your Kaibab squirrel sighting is so cool! I didn’t know such a thing existed. I didn’t know about the Kaibab squirrel either. The white trail really got my attention! Happy to hear that so many people are satisfied with our “old fashioned” photo & word blog. I really don’t have it in me to create and edit videos. Happy Thanksgiving to you as well! Happy Thanksgiving you two. Looking forward to turkey and all the trimmings. If you had a permanent address I would send you a care package. Awww..that’s so nice. We had a lovely Thanksgiving spent with family in Zion NP. Happy t-day to you as well. How wonderful to have a National Park to yourselves. Doesn’t get much better. I’ve only seen one of those squirrels before and he was too quick for me to photograph. I’m with you on the whole video thing. I look forward to hearing where you stay in Hurricane. 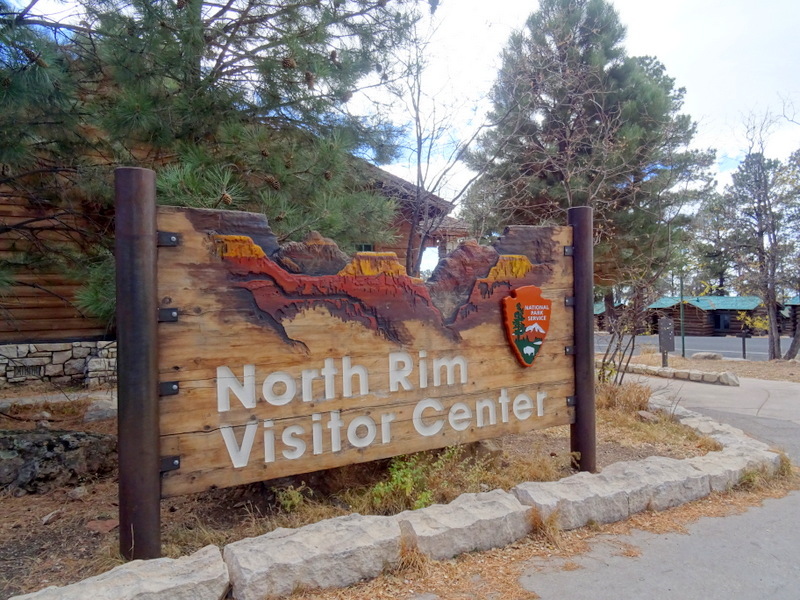 We postponed a trip to the North Rim for too many years. We finally went last month. The drive through Zion was spectacular. What a wonderful surprise when we arrived.The canyon views were awesome. Aspens in full glory along the way. Dinner in the great main dining room was super. Our studio room a short walk away was just right. We saw one Kaibab squirell. We will definitely go back again. Oh how fun! I was thinking that the views from inside the lodge must be fantastic. We need to go back some year when all the buildings are open. Please count me in the “blog” crowd and not the video. I like to read because I can do so at my own pace and easily re-read sections or find information. Great Blog! 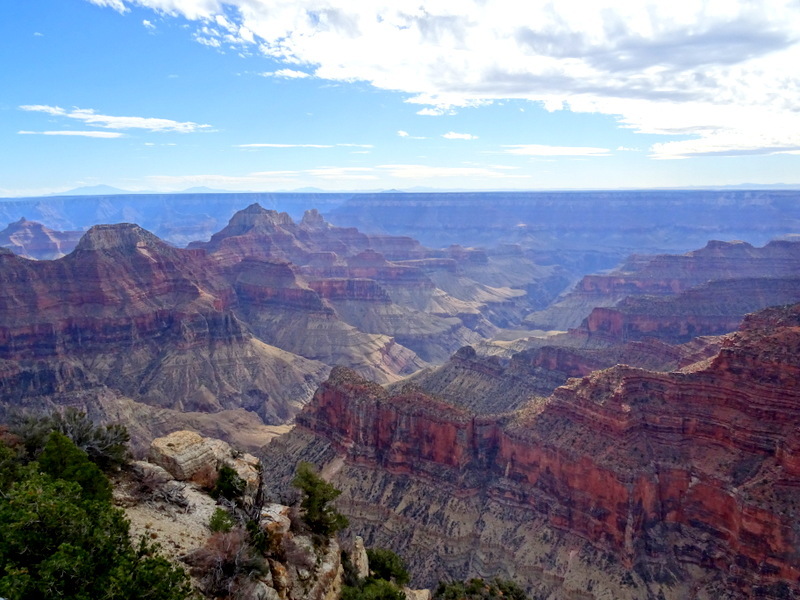 But … hard to read about people hiking slot canyons, going to the Grand Canyon, while I’m at work! Oh well, 2019 and I’ll be out on the road enjoying like you do now. Have a great December, and thanks again for all the great info! I agree! I’ve always preferred reading to watching. Sorry to tease you with all our fun adventures. Hang in there. 2019 will be here before you know it!